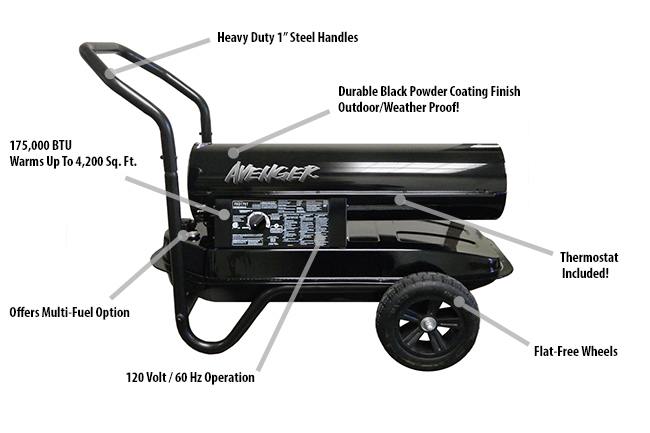 The Avenger Portable Kerosene/Diesel Forced Air Commercial Heater gives you high-end features with reliable longevity. This heavy-duty heater comes with flat-free wheels to roll out powerful heat of 175,000 BTU anywhere you want. Perfect for garages, construction sites, barns, factories or warehouses, this heavy-duty kerosene heater instantly takes out the chill. Designed, Engineered and Assembled in the U.S.A.
Power Cord (ft.): 6 in. Product Weight (Without Fuel): 72 lbs.